Power BI は、個人用レポートおよび視覚エフェクト ツールのほか、グループ プロジェクト、部門、または会社全体の背後にある分析および意思決定エンジンとしても使用できます。Power BI can be your personal report and visualization tool, and can also serve as the analytics and decision engine behind group projects, divisions, or entire corporations. 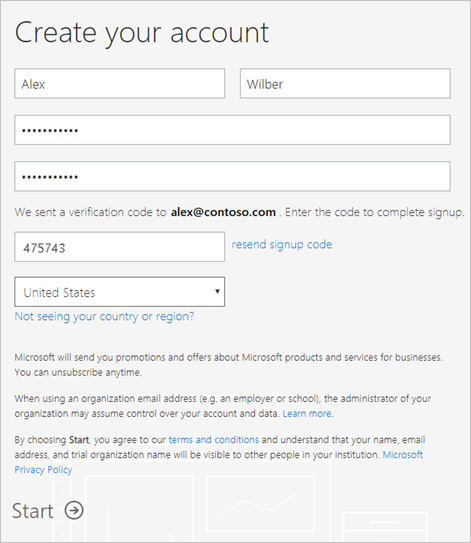 この記事では、個人として Power BI の試用版にサインアップする方法について説明します。This article explains how to sign up for a Power BI trial as an individual. Power BI 管理者であれば、「組織での Power BI のライセンス」を参照してください。If you're a Power BI administrator, see Power BI licensing in your organization. Power BI では、職場または学校のメール アドレスを使用する必要があります。Power BI requires that you use a work or school email address to sign up. コンシューマー電子メール サービスまたは通信プロバイダーが提供している電子メール アドレスではサインアップできません。You cannot sign up using email addresses provided by consumer email services or telecommunication providers. これには、outlook.com、hotmail.com、gmail.com などが含まれます。This includes outlook.com, hotmail.com, gmail.com and others. サインアップ後は個人アカウントなど、メール アドレスの種類を問わず、ゲスト ユーザーを招待し、自分の Power BI コンテンツを見せることができます。After you sign up, you can invite guest users to see your Power BI content with any email address, including personal accounts. 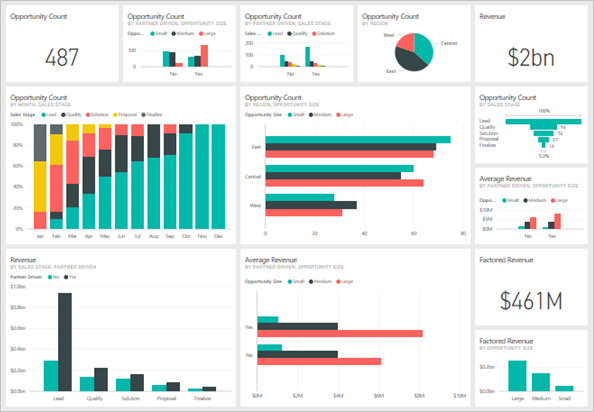 .gov または .mil のアドレスで Power BI にサインアップすることはできますが、プロセスが異なります。You can sign-up for Power BI with .gov or .mil addresses, but this requires a different process. 詳細については、「Power BI サービスに米国政府組織を登録する」をご覧くださいFor more information, see Enroll your US Government organization in the Power BI service. Power BI Pro の試用版には、以下の手順でサインアップします。Follow these steps to sign up for a Power BI Pro trial. この試用の有効期限については、次のセクション「試用期限」をご覧ください。See the next section, Trial expiration, to understand your options when this trial expires. Power BI のサインアップ ページにアクセスします。Go to the sign-up page in Power BI. メール アドレスを入力し、[サインアップ] を選択します。Enter your email address then select Sign up. 次のようなメッセージが表示されたら、確認コードを受信するためのオプションを選択し、サインアップの次の手順に進みます。If you get a message like the following, choose an option to receive a verification code, then continue to the next step in this procedure. 次のようなメッセージが表示されたら、サインインの手順を完了し、Power BI を使用します。If you get a message like the following, complete the steps to sign in and use Power BI. 受け取ったコードを入力し、[サインアップ] を選択します。Enter the code that you received then select Sign up. 次のようなメッセージが届いていないかメールを確認します。Check your email for a message like the following. 次の画面で自分の情報とメールに記載されている確認コードを入力します。On the next screen, enter your information and the verification code from the email. リージョンを選択し、この画面からリンク先に移動してポリシーを確認し、[開始] を選択します。Select a region, review the policies that are linked from this screen, then select Start. https://app.powerbi.com に移動したら、Power BI の使用を開始できます。You're then taken to https://app.powerbi.com, and you can begin using Power BI. Power BI Pro の試用期間が終わると、ライセンスが Power BI (無料) ライセンスに変更されます。When your Power BI pro trial expires, your license is changed to a Power BI (free) license. その場合、Power BI Pro ライセンスが必要な機能にアクセスできなくなります。When this happens, you no longer have access to features that require a Power BI Pro license. 詳細については、ライセンス タイプ別機能に関する記事を参照してください。For more information, see Features by license type. Power BI (無料) ライセンスで十分な場合、何もする必要はありません。If a Power BI (free) license is sufficient, no action is required. Power BI Pro の機能を活用する場合、Power BI Pro ライセンスの購入について IT 管理者にお問い合わせください。If you want to take advantage of Power BI Pro features, contact your IT administrator about purchasing a Power BI Pro license. 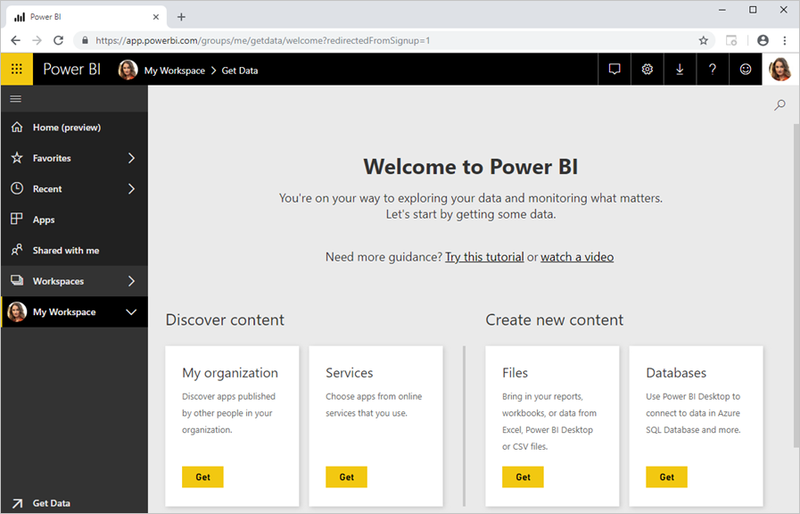 ほとんどの場合、前述のプロセスに従うことで Power BI にサインアップできます。In most cases, you can sign up for Power BI by following the process just described. しかしながら、サインアップを妨げる問題が存在します。That said, there are issues that can prevent you from signing up. そのような問題と回避策を次の表にまとめています。We cover these issues and workarounds in the following table. You entered a personal email address:Please enter your work email address so we can securely store your company's data. (個人のメール アドレスが入力されました: 会社のデータに安全に保存できるように、職場の電子メール アドレスを入力してください。)You entered a personal email address: Please enter your work email address so we can securely store your company's data. "That looks like a personal email address. (個人の電子メール アドレスが指定された可能性があります。)Enter your work address so we can connect you with others in your company. (勤務先の他のユーザーと接続できるよう、勤務先のメール アドレスをご入力ください。)And don’t worry. (ご心配なさる必要はありません。)We won't share your address with anyone. (Microsoft では、あなたのメール アドレスを他のだれかと共有することは一切ありません。)"That looks like a personal email address. Enter your work address so we can connect you with others in your company. And don’t worry. We won’t share your address with anyone. Power BI は、コンシューマー電子メール サービスまたは通信プロバイダーが提供している電子メール アドレスをサポートしていません。Power BI does not support email addresses provided by consumer email services or telecommunications providers. サインアップを完了させるには、あなたの勤務先または学校から割り当てられているメール アドレスを使用して、もう一度お試しください。To complete signup, try again using an email address assigned by your work or school. それでもサインアップできず、より高度なセットアップ プロセスを実行する場合は、新しい Office 365 試用版サブスクリプションに登録して、そのメール アドレスを使用してサインアップしてください。If you still can't sign up and are willing to complete a more advanced setup process, you can register for a new Office 365 trial subscription and use that email address to sign up. 既存ユーザーに自分をゲストとして招待してもらうこともできます。You can also have an existing user invite you as a guest. "We can't finish signing you up. 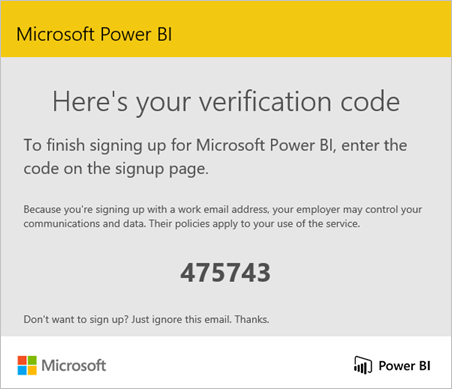 (サインアップを完了できません。)Your IT department has turned off signup for Microsoft Power BI. (あなたの勤務先の IT 部門が、Microsoft Power BI のサインアップを無効にしています。)Contact them to complete signup. (IT 部門に連絡して、サインアップを完了させてください。)"We can't finish signing you up. Your IT department has turned off signup for Microsoft Power BI. Contact them to complete signup. "That looks like a personal email address. (個人の電子メール アドレスが指定された可能性があります。)Enter your work address so we can connect you with others in your company. (勤務先の他のユーザーと接続できるよう、勤務先のメール アドレスをご入力ください。)And don’t worry. (ご心配なさる必要はありません。)We won't share your address with anyone. (Microsoft では、あなたのメール アドレスを他のだれかと共有することは一切ありません。)"That looks like a personal email address. Enter your work address so we can connect you with others in your company. And don’t worry. We won’t share your address with anyone. 組織の IT 管理者によって、Power BI のセルフサービス サインアップが無効にされています。Your organization’s IT administrator has disabled self-service signup for Power BI. サインアップの完了後、手順に従ってサインアップを有効にするように IT 管理者に要請します。To complete signup, contact your IT administrator and ask them to follow the instructions to enable sign-up. パートナーを通じて Office 365 にサインアップする場合に、この問題が発生する可能性があります。You may also experience this problem if you signed up for Office 365 through a partner. Try signing in with that, and if it doesn't work, contact your IT department. (その ID を使用してサインインしてみてください。その ID が機能しない場合は、IT 部門にお問い合わせください。)"We can't find you at contoso.com. Do you use a different ID at work or school? Try signing in with that, and if it doesn't work, contact your IT department. お客様の組織では、Office 365 と他の Microsoft サービスにサインインするために、メール アドレスと異なる ID を使用しています。Your organization uses IDs to sign in to Office 365 and other Microsoft services that are different than your email address. たとえば、メール アドレスが Nancy.Smith@contoso.com で、ID が nancys@contoso.com の場合です。For example, your email address might be Nancy.Smith@contoso.com but your ID is nancys@contoso.com. サインアップを完了させるには、Office 365 または他の Microsoft サービスにサインインするために組織から割り当てられている ID を使用してください。To complete signup, use the ID that your organization has assigned to for signing in to Office 365 or other Microsoft services. この ID が分からない場合は、IT 管理者にお問い合わせください。If you don't know what this is, contact your IT administrator.